8 April 2019 – On 5th April, the international animal welfare organisation FOUR PAWS successfully transferred bear Dushi to its BEAR SANCTUARY Müritz in northern Germany. FOUR PAWS rescued Dushi in October 2018 together with ten other neglected wild animals from the Safari Park Zoo in Albania. There she lived in the dirt for years, without access to fresh water. But now a new chapter begins for the three-legged bear, who had been caught in a bear trap as a cub. 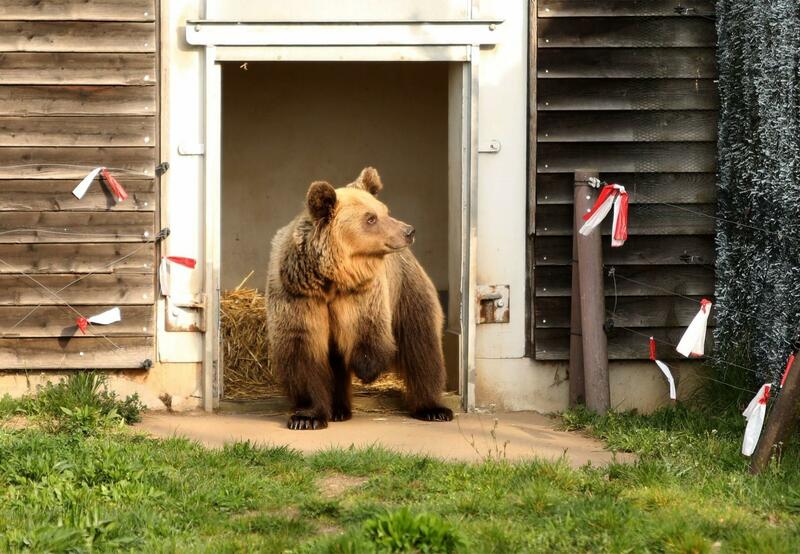 After a temporary accommodation at Tirana Zoo, Dushi will now find a species-appropriate and permanent home in the natural surroundings of BEAR SANCTUARY Müritz. After FOUR PAWS received the green light from the Albanian authorities, Dushi’s journey to her new home in Germany began on April 3rd. Veterinarian Marc Gölkel from the Leibniz Institute for Zoo and Wildlife Research (IZW) was already involved in Dushi’s rescue and took care of her well-being during the transfer. On April 5th, the FOUR PAWS bear ambulance finally arrived with Dushi at BEAR SANCTUARY Müritz after a 40-hour drive through nine countries. After the successful rescue mission, FOUR PAWS temporarily accommodated Dushi at Tirana Zoo. There the bear was able to recover from the hardships of her past and the extensive evacuation from Safari Park Zoo - also known as “Europe's worst zoo.” “When she was rescued, Dushi was too thin and had severe behavioural problems. She lived for years in a tiny, filthy enclosure and couldn’t get any fresh water,” says veterinarian Marc Gölkel. “Since Dushi receives appropriate food, she’s reached a healthy weight. Her fur also shows that her condition has significantly improved. However, her teeth are still in urgent need of treatment: two of her canines are broken and inflamed, and in general her teeth show numerous lesions due to biting on the cage bars and years of malnutrition,” he adds. Dushi’s new home, BEAR SANCTUARY Müritz, is already home to 16 rescued brown bears. Including Dushi, a total of 100 bears currently live in the seven FOUR PAWS bear sanctuaries in Germany, Austria, Switzerland, Bulgaria, Ukraine, Kosovo and Vietnam. FOUR PAWS works tirelessly to improve the situation of captive bears in Europe and Vietnam. However, hundreds of bears still live in inappropriate conditions. They are exploited for the bile industry in Vietnam or as bait and entertainment objects in the Ukraine and Southeast Europe. FOUR PAWS’ goal for 2019, and beyond, is to continue the #saddestbears initiative for bears in need in Vietnam, Ukraine and Southeast Europe and improve their keeping conditions. To this end, FOUR PAWS appeals to the respective governments to introduce changes in legislation to protect the animals and to support FOUR PAWS in the re-accommodation of confiscated animals in suitable sanctuaries. In addition to Dushi, FOUR PAWS also rescued the three male lions Lenci, Zhaku and Bobby from Safari Park Zoo. They were also temporarily accommodated at Tirana Zoo. FOUR PAWS is planning to take the lions to their Big Cat Centre FELIDA in the Netherlands, where they will receive special care to help them recover from their past. The animal welfare organisation is currently waiting for green light from the Albanian authorities to give the big cats a better life as well.